HOW can the European Patent Office (EPO) ever recover its reputation when its main if not sole asset (the staff) gets treated so badly? On 12 September 2018, the CSC met with you to discuss (among other issues) the worrying situation of Mr Prunier, an elected CSC member and union official who was unlawfully dismissed from service based on trumped up charges while on certified sick leave. You informed us that Mr Prunier’s file was on your desk. In October 2018 you issued an office-wide Communiqué in which you declared that your administration was in favour of reaching amicable settlements for on-going complaints. However, the Office does not appear to have contacted Mr Prunier to enter into any such discussion (despite the fact that he is still severely ill and any prolongation will only make it worse). 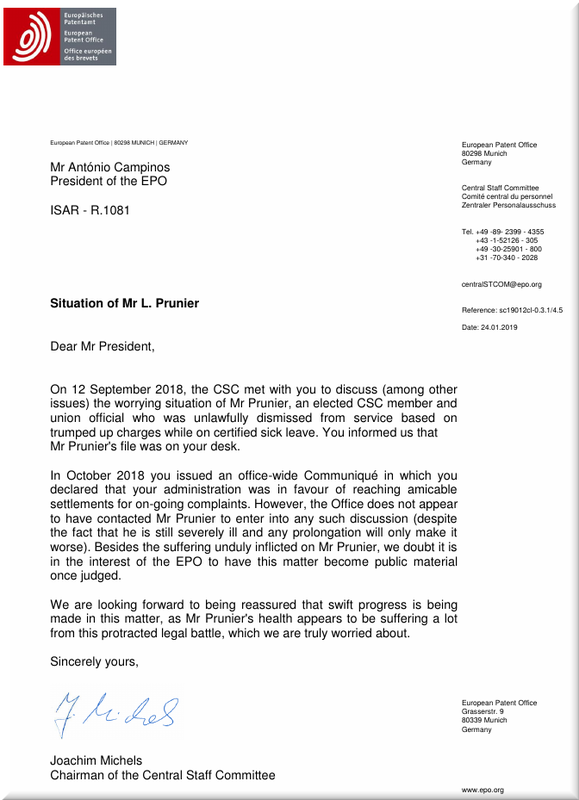 Besides the suffering unduly inflicted on Mr Prunier, we doubt it is in the interest of the EPO to have this matter become public material once judged. We are looking forward to being reassured that swift progress is being made in this matter, as Mr Prunier’s health appears to be suffering a lot from this protracted legal battle, which we are truly worried about.